RED-X stands for maximum operator comfort and convenience. Lightweight flat hoses are much easier to handle than conventional heavy and bulky ones. Manufactured with a special woven reinforcement, they are lighter than conventional hoses, yet remain extremely resistant to bursting or tearing, giving them a long life and saving you money. 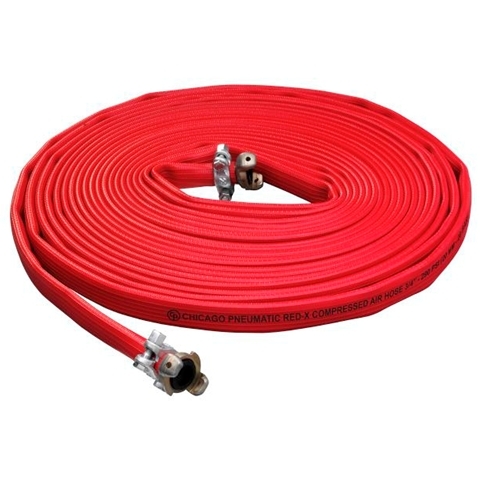 The RED-X flat hose is ideal for covering long distances, because it is extremely flexible and easy to unroll. It boasts one third the weight of a conventional rubber hose due to a special woven reinforcement that is one fifth the thickness of a conventional hose. Since the RED-X hose is flat, it takes less than half the storage space of a conventional rubber hose. Because of the woven reinforcement, the RED-X flat hose features very high resistance to bursting and high tensile strength (end pull). The special weave means that if the hose ruptures in spite of all precautions being taken, it will do so longitudinally instead of crosswise. This means added safety for users, as the hose will remain in one piece. In other words, no more whipping hose ends. RED-X flat hoses can be used with products such as pneumatic rock drills and breakers, crawlers, water well drill rigs and water pumps on construction sites, in mines and in the agricultural sector.